We should put it to good use. The approach used in one dimension is still appropriate. Using vectors in two dimensions requires a lot more trigonometry than in one dimension. It is the extraction of scalar relationships that requires some effort. The best way to learn is to see some examples. Here is another example of Newton's Second Law. I show an approach to dealing with incline problems. For this example, we look at a mass being hung by a series of ropes. I show another trick in dealing with Newton's Second Law problems, where the object is a vertex of ropes. 1. A 750 kg mass is hanging from two cables, one is set 75 degrees from the horizontal and the other is set 60 degrees. What are the tensions in the cables? 2. Using Newton's second law, derive the acceleration of an object sliding down a frictionless surface set an angle q above the horizontal. 3. You think a pulley gives you leverage? Your car is stuck and there is a tree 100 m behind you. 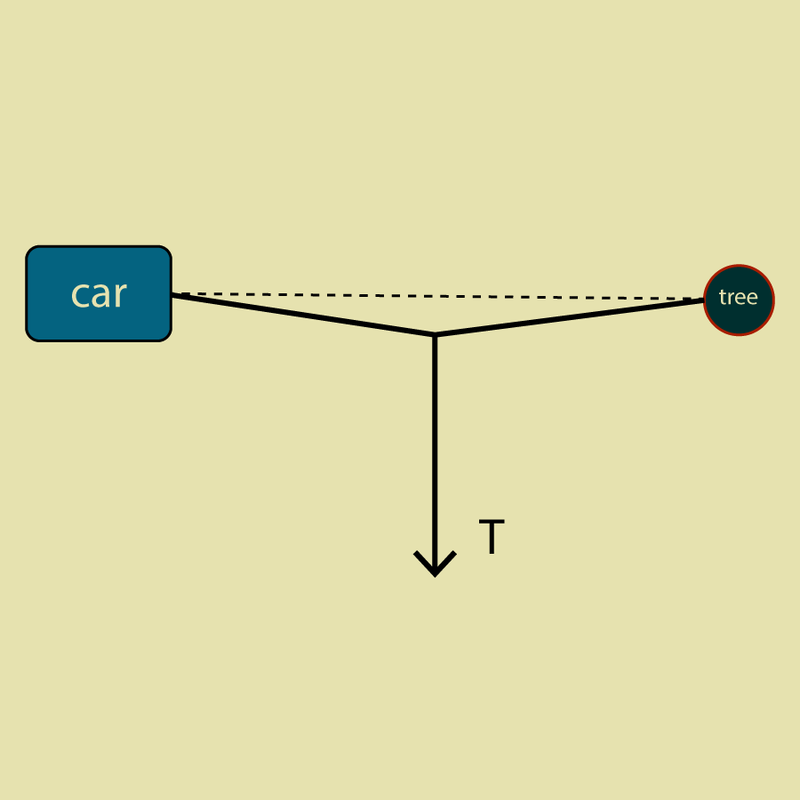 Instead of using a pulley, you attach a cable between the car and the tree and then pull on the cable in the middle the perpendicular direction with a 10,000 N tension force, T. If the cable is taught at a 2 degree angle (see figure), what is the force pulling on the car?